Note: The sale on this course ends Oct. 26, 2017. To get the lower prices, go to www.ordergreatcourses.com. I am not affiliated with that site. I get nothing out of this. But I really do recommend it. Would you like to jumpstart your genealogical research? I found a great way for you to advance to a higher level—whether you're somewhat new to family tree research or you've been at it for a long time. Once in a while I get a catalog in the mail from a company called The Great Courses®. The catalog is like a glossy magazine, and it's interesting to browse through. 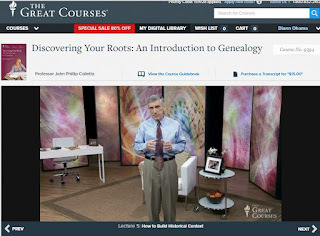 The latest catalog had a genealogy course to offer: Discovering Your Roots: An Introduction to Genealogy by Professor John Phillip Colletta. I read the description, and I felt it covered several areas I'd like to learn more about. I bought the online version so I can watch the 15, half-hour lessons at my computer and at my leisure. The cost was only $22.95—not as much as I might spend to go to a two-hour genealogy seminar. This low price is a huge sale. The regular price for watching the course on your computer is $169.95. If you go to the website to read about this course you'll see the full price. There's a red tab on the page advertising a 70% off sale—the drastic price reductions are a regular thing. Keep checking back to see when you can score the same deal I did. My first ancestor left Italy to come to America in 1890. 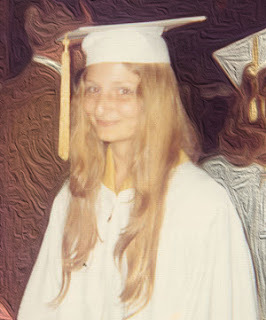 I have no ancestors who fought in the Civil War, the Spanish-American War, or the War of 1812. Only one or two fought in World War I. So I have little or no direct experience with early military records and pension records. That's one area where I know I have a lot to learn. But what is there that I don't know I don't know? Professor John Phillip Colletta is an interesting and enjoyable speaker. He weaves fascinating tales of ancestors while explaining how to use genealogy resources. He takes individual facts from the census, a ship manifest, or a military record to tell a richly detailed story of that ancestor's life. You can't help but be inspired to discover a fuller history of your own ancestors. If you take this course, you'll learn about specific websites and how they can help you with your family tree. You'll learn where to go for specific resources. You'll find out about records, maps, and techniques that may be completely new to you. So, if you're new to genealogy, this course can help you become a knowledgeable genealogist in a few hours. If you focus your searches on specific records—like census forms and ship manifests—this course can give you a much broader grasp of genealogy research techniques. If you've been at this family tree hobby for years, you can still gain a lot from this course. I'm sure you'll enjoy it as much as I did. The Great Courses. ©The Teaching Company, LLC. All rights reserved.